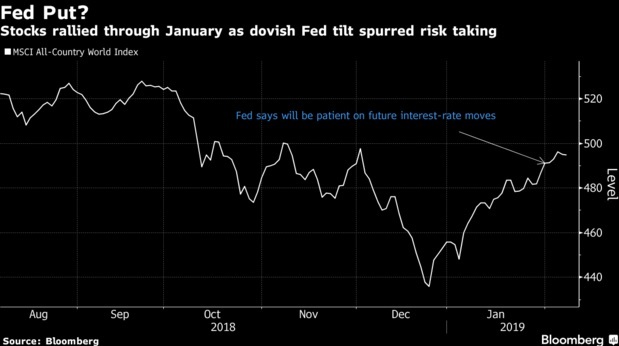 The Federal Reserve’s decision to pause further monetary policy tightening, and the chance of a positive surprise from China’s economy, have strategists at JPMorgan Chase & Co. boost their risk-taking positions, cutting cash levels and favoring industrial metals. 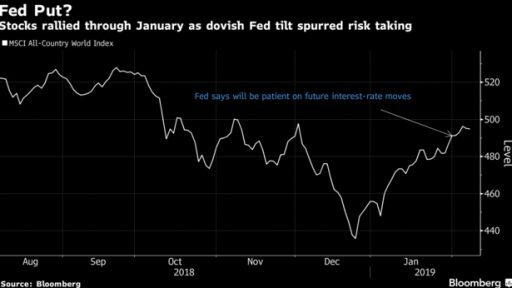 The global strategists are still favoring equities relative to bonds, saying in a monthly report that markets are still some way off from fully pricing in less tightening from the Fed. With valuations more supportive, they scrapped hedges that helped cushion performance going into December. They lifted allocations to emerging-market stocks and bonds. “This decisive dovish shift is removing some of the obstacles that caused the 2018 market fall and raises the prospect of 2019 being an asset-reflation year,” says Nikolaos Panigirtzoglou who is a JPMorgan strategist. The stocks are already up about 13 percent since the end of last year lows, though the rally is now showing signs of fatigue. Up next is a round of U.S.-China talks in Beijing. The latest data shows that the activity in the Chinese economy is stabilizing and there is signs of progress in the talks.